Y’all. This weekend was one for the books for my family. On Saturday, more than 80 women gathered at Collected LKN to worship, grow, and be launched into their God-breathed dreams. Then on Sunday, more than 300 people came together to join in one voice of praise to our God of abundant blessing during the first worship service in our new church building. Everything God did in the past two days was beyond anything we could have imagined. It’s incredible to think of what these tiny seedlings might grow into. Sunday: Newsong's First Sunday in our new space! Life has been pretty full of preparation these last few weeks. On top of preparing for the events over the weekend, I’m also leaving for Kenya very soon, which always requires quite a bit of planning, meetings, administrative work, and packing. In the midst of the fullness, last week we lost a close friend of the family to a sudden heart attack. He was one of my husband's best friends and his family is so very dear to us. Hosting out-of-town guests in our home, attending the services, and walking through personal grief added to the expected level of difficulty leading up to the weekend. Something happened to me after Collected on Saturday. In the interest of practicing what I preach and keeping it real, I want to explore and share what I experienced. While we were cleaning up after the workshop, I found myself combatting terrible feelings of discouragement. I knew it was the enemy coming at me and took the thoughts captive and prayed for the Holy Spirit to take over my thoughts and emotions, and yet they would creep back in again and again. I couldn’t understand why I wasn’t elated by all that God did and focused on how the Spirit moved in the hearts of so many of the women who attended. Instead, my mind was flooded with thoughts of all the little things that didn’t go as planned and things I could have done better. As we cleaned up and prepared the church building for Sunday morning, there were a couple of private moments when I confessed one-on-one what was happening in my heart and mind to two different members of my team. We immediately prayed it out, declared Truth, and claimed victory over the enemy’s efforts to steal joy, distract, and discourage. Later, I shared what was happening with my trusty bestie and she gave me a Holy Spirit spanking, as we call it. God used her, and the other two women from earlier to remind me of the Truth. Later still, my husband prayed over me and I remembered everything that has led us to this point. All the ways He's called, instructed, and covered all of this with His Grace. I zoomed out to see things for what they were and by the time I fell into bed, the heaviness of the lies and attack had finally lifted and the enemy was defeated once again. On Sunday morning, the joy of our first service in our new church home seemed to multiply the late arrival of celebration in my heart from what had happened the day before. Tears came so easily and worship was more intimate than ever before. I was a hot mess as all the keep-it-together-ness of the week before unraveled in the safety of my church community. Looking back for places where God was moving and expressing gratitude for His faithfulness feels like the right thing to do this morning. When I review, I see where He strengthened and sustained me when I was weak. He lined up an army of a team to prepare the new church building in time for the weekend. He called and empowered a gifted team of women to come alongside Miklala, Jes, and me who made things happen without being asked. He gave us words of Truth for the women who needed them most at Collected. He gave me the courage to be vulnerable and ask for help in shutting down the enemy’s schemes. He moved mightily in the hearts and lives of the people who attended both of the weekend’s events. He provided faithful friends to sharpen me, and supportive family that walks with me arm-in-arm into my dreams. He inspired generosity in the hearts of the women at Collected and we raised more than $3,000 for Flourish Kenya!!! And He brought a powerful presence into His house for our first Sunday in the new space. What a generous and loving God we serve. As I was giving thanks for all of these things and more this morning, there were few ideas He emphasized with me in the midst of it all and I want to share them with you. 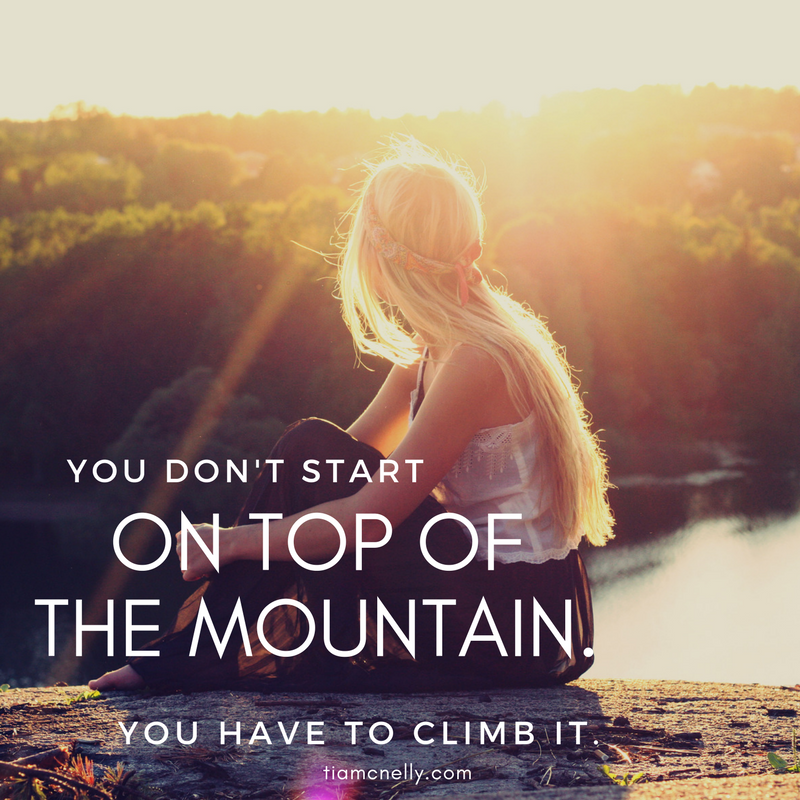 1) You don’t start on top of the mountain. You have to climb it. Getting there takes hard work. You're going to struggle to keep your footing and you may need to stop and catch your breath once in awhile. You will probably slip and have to climb back up certain portions as you ascend, maybe more than once. But you have to just keep climbing until you reach the summit. 2) Walking in victory is a choice and it's imperative. When you are doing Kingdom work, the enemy puts a target on your back. “But You, oh Lord, are a shield around me.” (Psalm 3:3) We are surrounded by His protection and have nothing to fear… but we will still have to battle it out at times. Knowing that victory is yours through Christ in the end, one way or another, is the key to remaining strong through the fight. 3) The Spirit-led wisdom of the people around you is what will keep you grounded and rooted in Truth when you can’t find your way out of oppression on your own. We are meant to stand up for one another and do battle together. Be willing to bring what the enemy is doing in the darkness into the light. We have to call it out and crush it before it can take root. This can’t happen if we aren’t each actively seeking God’s wisdom on a regular basis so that we are armed and ready when our comrades need us. Have you had times when the fullness of life took your mind, heart, and spirit for a roller-coaster ride like the one I experienced this weekend? Do you need some iron to rub up against so you can be sharp right now in the midst of a battle? What stories of victory can you share today? Comment below or email me at hello@tiamcnelly.com .